Originated from Shanghai, raised in Hong Kong, Wang Chung was an acrobat when “discovered” by top action director Chang Cheh, who brought him to Shaw Brothers in 1969. He had several credits before attaining stardom in Police Force. After more than a dozen lead roles, He made his directorial debut with The Informer in 1980, in which he also served as scriptwriter and star. Other directing credits include Cop Of The Town. 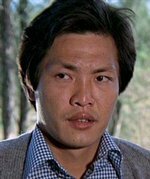 Ever since Police Force, Wang has been most closely identified with policeman roles, which he has played on television and in such movies as Cops And Robbers.